Kayaker Adam van Koeverden's silver-medal performance on Day 15 of the Beijing Games pushed Canada's medal tally to 18 - three gold, nine silver, six bronze. Kayaker Adam van Koeverden's silver-medal performance on Day 15 of the Beijing Games pushed Canada's medal tally to 18 — three gold, nine silver, six bronze. With no Canadians scheduled to compete Sunday when the Games close, Canada's medal haul equals the total from the 1992 Barcelona Olympics. The Beijing Games marks the country's third-best performance at the Olympics — Canada won 22 medals in 1996 in Atlanta and 44 in 1984 in Los Angeles, which were boycotted by the Soviet Union and several Eastern Bloc countries. Canadian Adam van Koeverden won the silver medal in the K-1 500 on Saturday, finding some redemption after a dismal performance in the 1000 metres the day before. "It was a great moment and the feeling is mostly relief," he told CBC Sports. "Yesterday, I just didn’t feel like myself. Today, I was climbing back up, getting it back a little bit, but that last 200 still didn’t feel like me. It was a struggle, a well-fought struggle, and I’m really, really happy." Van Koeverden had a commanding lead for most of the race but, with about ten metres remaining, he was edged out by former training partner, Australian Ken Wallace, who clocked a time of one minute and 37.252 seconds. Tim Brabants (1:37.671) of Great Britain claimed the bronze. Karine Sergerie fought her way to Canada's best-ever finish in taekwondo, winning silver in the 67-kilogram event. The 23-year-old from Ste-Catherine, Que., lost a close gold-medal bout to the defending and reigning world champion, South Korea's Kyungseon Hwang. The bronze medallist at the 2004 Olympic Games, the South Korean beat Sergerie 2-1, scoring her final point in the last 30 seconds. "The gold medal was the dream for me. I'm happy that I have the silver and I hope my country is proud of me, but this silver just pushes me even harder to come back and win that gold medal," Sergerie told CBC. Canadian Thomas Hall won a bronze medal in the C-1 1,000 canoe race, moving from fourth to third in the final 200 metres. He finished in a time of three minutes and 53.653 seconds. Hall caught Vadim Menkov of Uzbekistan in the final 200 metres and finished about half a second ahead of him to reach the podium. "I'm ecstatic. I don't know what else to say," Hall told CBC Sports. "I knew I had the ability but I didn't know if I really had it on today. I'm really thrilled and I couldn't be happier." Equestrian Eric Lamaze of Schomberg, Ont., won the gold medal in the Olympic individual show-jumping competition. Riding a horse named Hickstead, the Canadian defeated Sweden's Rolf-Goran Bengtsson in a jump-off to earn Canada's third gold medal of the Beijing Games. The victory was sweet redemption for Lamaze, who missed out on the 1996 Olympics in Atlanta and the 2000 Sydney Games due to positive drug tests. He's also a member of the Canadian team that won silver in the team jump competition in China. "When you give people chances and allow them to come back from their mistakes, great things happen and I'm a perfect example that you shouldn't give up on people," an emotional Lamaze told CBC Sports. Canadian diver Emilie Heymans turned in her best-ever individual Olympic performance, capturing a silver medal. Heymans, who hails from St-Lambert, Que., secured her second-place standing with a stellar fifth and final dive at the National Aquatics Center, for a total score of 437.05. "I'm just really happy. It's hard work for my entire life that came through now," Heymans told CBC Sports after matching fellow Canadian Alexandre Despatie's showing in men's springboard. "I trained really hard for this and I'm just really happy that I finally get a medal in my individual event." Canadian Priscilla Lopes-Schliep won a bronze medal in the 100-metre hurdles final, a race won by Dawn Harper of the United States. Harper was timed in 12.54 seconds, with Sally McLellan of Australia taking silver. Lopes-Schliep, of Whitby, Ont., ran in 12.64 seconds, the same time as McLellan, but officials ruled that McLellan was ahead by mere thousandths of a second. Alexandre Despatie won Canada's third medal on Day 11, finishing second in the men's three-metre springboard diving competition. Despatie, a 23-year-old native of Laval, Que., finished with a total score of 536.65 points from six dives to claim the silver medal. He also took the silver medal at the 2004 Athens Games. "My silver medal is gold to me because of all the bad things that happened to me this year," said Despatie. "I was able to get it together." Canada's Jason Burnett won silver in men's trampoline. Burnett, 21, was the second finalist on the trampoline and earned a score of 40.70 for his routine, which featured a degree of difficulty of 16.8 - the highest in the final. The three-time Canadian champion from Toronto told the CBC that playing it safe with an easier routine wasn't even a consideration. "No, definitely not," Burnett said. "This is the Olympics. This is it. Why play it safe? "You might as well put it all on the line and go for broke, and it paid off today with a silver medal." Canada's Simon Whitfield captured the silver medal in the men's triathlon. Whitfield, who lives in Victoria, mounted a furious rally to briefly take the lead late in the closing sprint before being overtaken over the final stretch by Germany's Jan Frodeno. "I kind of fought my way on there, and I thought there's no time like the present," Whitfield said. "I tried to make it a battle of pure willpower. I gave it everything I had." Canada earned a silver in the team jumping competition, giving veteran rider Ian Millar his first medal in his ninth Olympic appearance. Canada was tied with the United States with 20 penalty points at the Hong Kong equestrian venue, but three American riders went through the course perfectly in a jump-off. Millar, 61, led Canada into the tiebreaker round with a perfect ride on In Style. Millar was due third in the jump-off, but the Americans ensured he didn't have a chance to go again. "The support we've had all year, everybody's recognized that we had a shot at this thing, such enthusiasm, such support, and that's a big motivator to us," Millar told CBC Sports. "We all say thank you very much to those who support it and those who believe in us." Jill Henselwood of Oxford Mills, Ont., and Eric Lamaze of Schombeg, Ont., also competed for Canada. Henselwood rode Special Ed, with Lamaze on Hickstead. Canada's Karen Cockburn won the silver medal in the women's trampoline, her third Olympic medal in the event. Cockburn, of Stouffville, Ont., earned a score of 37.00 for her routine, which had a degree of difficulty of 14.4, to earn Canada its eighth medal overall of the Games. "It feels amazing," Cockburn told the CBC. "I was just honoured to be here competing in my third Games for Canada and to come out again on the podium with a silver medal… I don't think it's sunk in yet, but I'm really happy." The men's eight rowing team finished the job they started four years ago by winning a gold medal. Canada led wire-to-wire in the final race at Beijing's Shunyi Olympic rowing park. Taking the silver was Great Britain and taking the bronze was the U.S.
Canadian women's lightweight double sculls rowing pair Melanie Kok and Tracy Cameron clinched the bronze medal in a photo finish. Kok and Cameron finished in six minutes, 56.68 seconds, behind Kirsten van der Kolk and Marit van Eupen of the Netherlands, who won the gold, and Sanna Sten and Minna Niemenen of Finland, who took silver. The race came to such a close finish that the result was in doubt for several seconds before the Canadians realized they had beaten the Germans by 0.04 seconds. "We had to find a little something extra to get beyond them," Cameron told the CBC. "Just close your eyes and go." The Canadian lightweight men's four won Canada's second rowing bronze. The crew of Iain Brambell, Jon Beare, Mike Lewis and Liam Parsons finished in five minutes, 50.09 seconds at Shunyi Olympic rowing park. Teenager Ryan Cochrane won Canada's first Olympic swimming medal since 2000, taking bronze in the 1,500-metre freestyle. The 19-year-old from Victoria finished third in a time of 14 minutes 42.69 seconds. Fourth-place finisher Yuriy Prilukov mounted a furious campaign for the bronze over the final few laps. But the Russian was held off at the end by Cochrane, who had battled Hackett for first place for much of the race. Canadian wrestler Tonya Verbeek won the second Olympic medal of her career and Canada's third of the Beijing Games on Day 8. 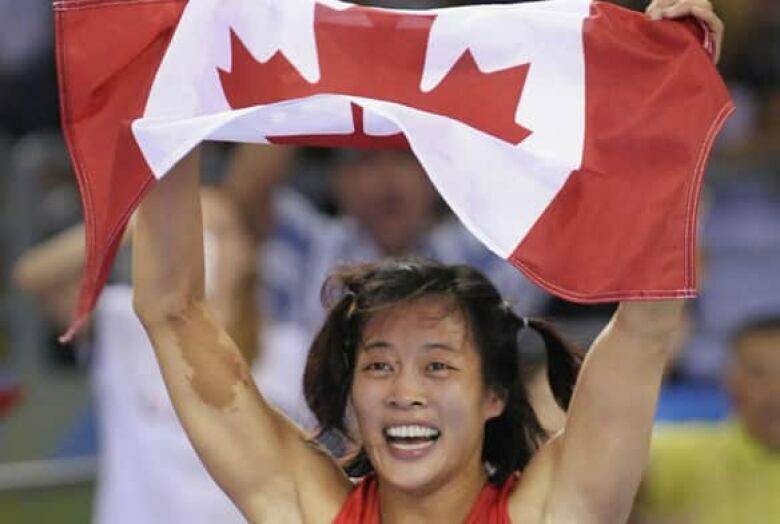 Wrestler Carol Huynh of Hazelton, B.C., won Canada's first gold medal on Day 8. The 27-year-old captured gold in the 48-kilogram freestyle weight class over Japan's Chiharu Icho by a score of 4-0 and 2-1. The Canadian men's rowing pair Scott Frandsen and Dave Calder ended Canada's Olympic medal drought on Day 8. The pair won a silver medal on the water at Shunyi Olympic rowing park on Saturday, the first Canadians to reach the medal podium in Beijing. "It was a tough race, we tried to ignore the fact that we haven't had a medal yet as a country, and just focus on our two [kilometres]," Calder told CBC Sports after the race.